﻿ Dakar Day 8 – Despres takes stage win to move in to third overall. Frenchman Cyril Despres powered his Red Bull KTM to the stage win on day eight of the Dakar and now holds third position overall with seven days remaining. Despres took 4h 7m 9s to complete the 294KM but was only able to beat overall leader Marc Coma by 1m 49s meaning that the Spanish Repsol KTM rider remains in control of the event. “We must have taken 2000 corners today. There wasn't much grip and I tried to stay standing up the whole time, shifting my weight back when braking and then moving it to the middle when accelerating. "At refuelling I saw that I had come back on Coma and Lopez and that Fretigne and Street were losing time. Then just after the CP1 we had a tricky bit of off-piste. Coma remains 1h 6m 28s ahead of Yamaha France rider David Fretigne onboard his WR450 with Despres third 1h 33m 34s off the lead. Although Coma has been in control since day one he knows that with the hardest days of the Dakar to come he will need to stay focussed and at his best to take his first event win since 2006. “It was technical today like an Enduro, there wasn't much grip and it was difficult to maintain a good pace without out-braking yourself. Although it was challenging it was fun to ride. "As was predicted I caught up Lopez and Cyril caught me and we crossed the line pretty much together. 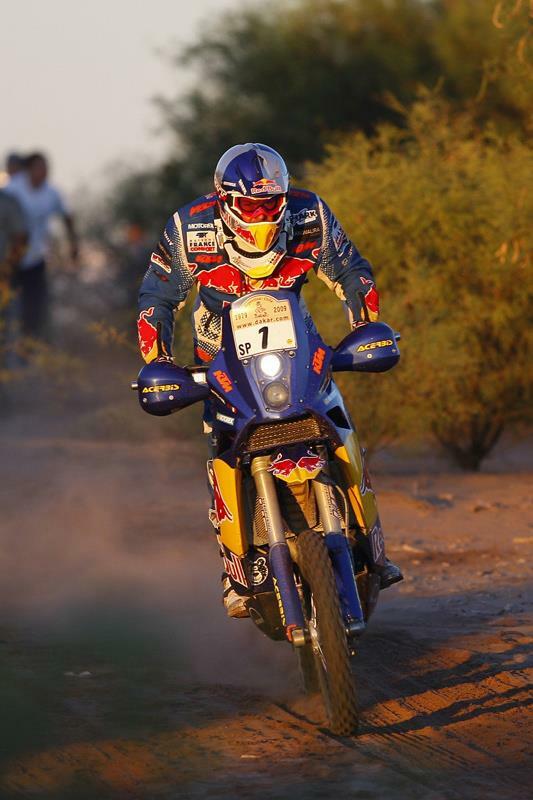 “So far it has been an extremely tough event - at least as hard as any other Dakar I have done before. My first week has gone reasonably well, and for sure I am happy to be in the lead, but the situation with the rear mousse has been a big additional stress. "All we can try and do is make the best choice for the day ahead and hope that it is the right one. Mick Extance was once again top Bit, with the Honda Europe rider finishing the day in 28th place with KTM man Stanley Watt in 30th. Craig Bounds had another impressive day to claim 43rd just 44m off Despres pace setting time with Ewan Buchan 92nd, Garry Ennis 120th, Simon Pavey 128th and Phillip Noone 129th.